If I understand your question correctly, more information is required to give you an answer. If I were to cut out a disc-shaped sliver of the torus, it would have a diameter of 3 miles, right? If this is the case, then there are multiple answers possible, depending on the curvature of the ship. I guess what we really need to know is how much open space you want in the middle. If there is space in the middle, like the image in the link you provided, then it's a different result. Both of these toruses could have a cross-sectional diameter of three miles, but would obviously be dramatically different in their size. I believe that's right. If you look at this pic, I'm talking about the diameter of the smaller, red circle. I do need to have space in the middle. Not sure how much, but considerably more than both of those pictures, I think. The ship is a torus, because it will provide artificial gravity by rotating around a fixed center. I don't think it needs to be too awfully big, but there will be an area in the middle where the generators that keep it rotating go, and a bit of space for storage & null-g recreation. There will be kind of 'spokes' coming off it to the torus proper, and these lead to elevators that come down into each section of the torus. I hope that makes a bit of sense. I really appreciate the help! Based on the info you've given, the distance from N-N would be directly related to how big the donut hole is. 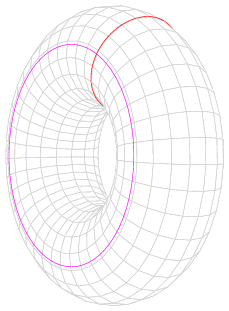 Once you decide how big it is, I'd be happy to figure out the circumference of the torus. If you're trying to figure out the distance on land to traverse the station, then I would also want to know how deep the soil would be relative to the 3 mile diameter. Thanks! kiwiria has been very helpful up above, too. I suppose I could use some advice. I'm not sure how big the center should be. The hub, so to speak, would probably do fine with a half-a-mile diameter. There would need to be some space for the shafts (also very large - like huge freight elevators). But would the center need to be as 'thick' as the torus to work as I want? Most likely, because I have the elevators (well, they call them nodes) coming out at different places - some dead center in one segment, some against one side wall or another in others. If that's the case, I guess the center hub might also need a three mile diameter, which I could put to use but it seems a bit excessive. I'd actually recommend a larger donut hole, as the centrifugal force would increase with the inner radius, so that the station could spin slower for the same gravitational effect. If you went with a 3 mile diameter center and an average of 1 mile high (hehehe) soil, you'd be looking at a distance of 22 miles to go from a starting point all around the station and return to the same point. Oh man, am I ever a geek. Sweet, thank you so much! I suppose I'll go with 3 mile center, then, but is that just the hole itself or the hub that it's rotating around? That gives a different length than kiwiria's figuring - 3 ; 56.5 ; 7.6 (Diameter of Centre;Length;Segments [all lengths in miles]). Is that because of the soil depth? If you can figure out the rotational speed, that would be so awesome. You would not be a geek, but a hero. I've been so far working on the very simplified assumption that one rotation/min = 1 g.
I was including the hub in the hole. Kiwiria and I are using different formulas. Mine's right, as I'm infallible. I'm off to work now, so I won't be able to work on it for a bit, but i'll get back to you on the rotational speed thing. Where did you come up with your 1g per turn per minute?